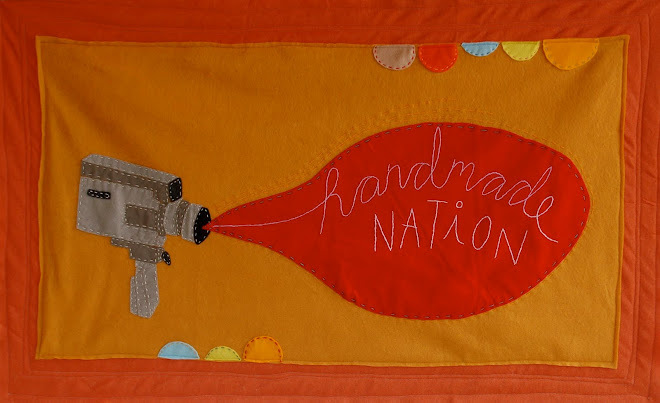 Handmade Nation Screenings + Events this weekend! Find director Faythe Levine in Arizona for the premiere in Phoenix doing an assortment of events over the weekend. Phoenix, AZ: Booksigning at Frances 3rd Anniversary Celebration, 10 W Camelback Rd. Tickets $10 available at Stinkweeds, Frances and MADE. Limited tickets available at door. Handmade Nation in support of Sublime Stitching! Oh big companies when will you learn that it's us, the people, that have the power. You can not get away with stealing our designs, copying our aesthetics or mocking up a business to "look" indie when it is not. We will not support you stealing from us! 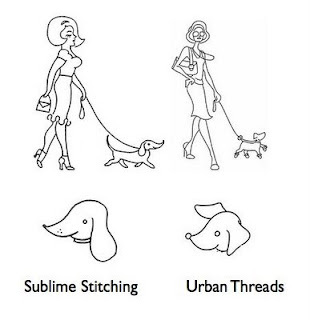 Everyone, please read the blog post HERE that clearly spells out the blatant rip-off of our close friend Jenny Hart's company Sublime Stitching by a company called Urban Threads that is attempting to look "home grown" when in reality they are a major corporation. Here is one example of the designs they have blatantly lifted from the Sublime Stitching catalog. Unreal. I can't stress the importance of reading this news and spreading the word. This is a time for our community to show solidarity and support. Ava Hegedus interviewed me for W+K radio before I went out to Portland earlier this month. Listen HERE. 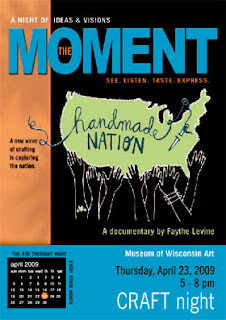 Museum of Wisconsin Art screening tomorrow! Thursday, April 23, 5 - 8 p.m. Feature on Dwell.com + Portland stuff! Today on Dwell.com an interview with yours truly. It was a fun one since they asked me all sorts of questions that normally I don't get! Read it HERE. Plus a clipping from Portland that you can see full size HERE. Rumor has is that the art director hand stitched those letters at home, LOVE IT! 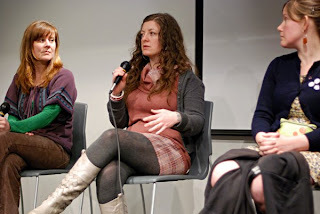 This is a photo from flickr user leethal of Jill Bliss, me and Susan Beal on the panel at the Museum of Contemporary Craft. Some photos from the weekend in Portland are HERE. So we have a lovely publicist over at our publisher Princeton Architectural Press named Katherine. Katherine does all sorts of amazing work and was recently joined by Andrew who also keeps all of our press in order. 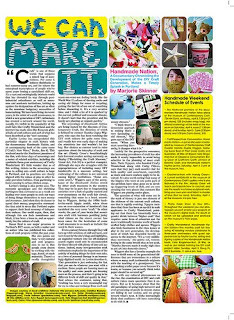 Andrew also runs the Handmade Nation facebook page for us and just posted all these clippings from the past month. Thanks guys! From Portland to Abu Dhabi, Yes even Abu Dhabi! Faythe & Cortney have the media addicted to DIY. Here are some quotes pulled from recent articles, for a more comprehensive list you can go to the link at the bottom of the page. Handmade Nation: The Rise of DIY Art, Craft, & Design is Available through Princeton Architectural Press. I am about to do a early morning interview on WNPR. More on the Portland trip later today! Video 3 out of 3 that was made for the Portland premiere of Handmade Nation this weekend just released. Tomorrow come see me and Handmade Nation in EUREKA!